Gary Stearman is a joy to listen to on TV as much as he is a joy to read. He would probably hate being called a “wordsmith,” but that’s what he is and what I appreciate most regarding his articles or his ability at interviewing is how his words just carry you along. It’s almost effortless. 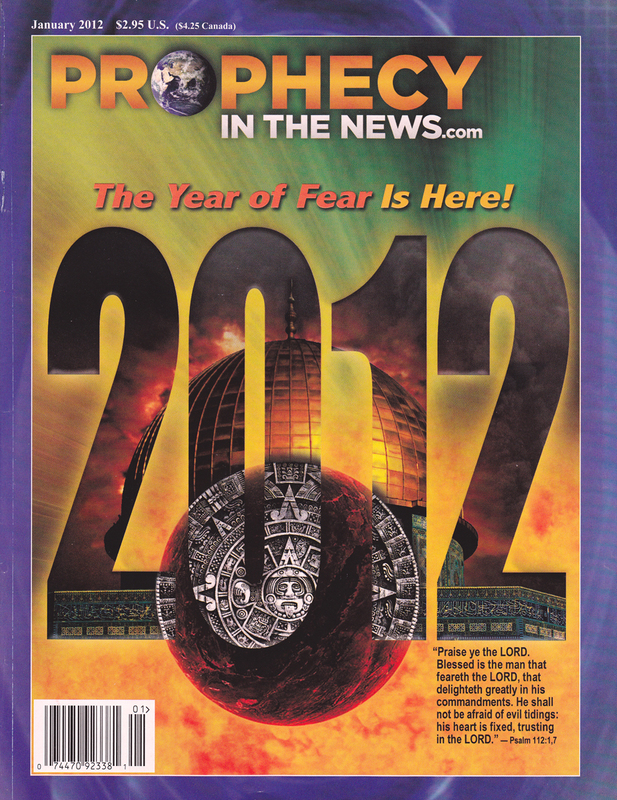 The latest issue of Prophecy in the News magazine arrived and on the cover was the title “The Year of Fear is Here!” with a large “2012” as well. Obviously, this is going to be an interesting year for everyone because of the Mayan so-called prophecies. What I find most interesting though – and Gary touches on this in his article – is the amount of fear that Christians are experiencing over the whole thing. Look, it’s easy to focus on what is happening in the news. To do so is downright depressing at times. More than one of my Christian friends has stated that they had to stop reading or listening to the news because it is depressing. They opted to get back into God’s Word for a while. I’ve done the same. This isn’t to say that I had stopped reading God’s Word. What I found though was that I was paying too much attention to the world and not enough to God. If we focus on the world’s activities, not only can we become depressed about it, but we can begin to lose hope. Why? Because we are seeing what is happening in the world and we are unable to see what God is doing. “On every street corner, the cry is heard: ‘Buy gold! Soon your money will be worthless!’ The specter of class economic warfare is burgeoning into full-blown public demonstrations. Street-marches (‘Occupy Wall Street,’ to name only one) are now commonplace, threatening to become large-scale mass rallies. Revolutionaries are calling for new governments. “In the Mideast, the Islamic Brotherhood move inexorably toward its vaunted caliphate, first regional, then global. Above all, as it calls for ‘death to Israel!’ and ‘death to America!’ The news is filled with the horrifying portents of an approaching war in Israel. Once they are unleashed, they will almost certainly intensify to global dimensions. Perhaps there will be a nuclear war. Mr. Stearman is just warming up here because he then goes into the area of 2012 prophecies. What is troubling to realize as he makes the round-up of prophecies and so-called Mayan prophecies, is how often Christians wind up following the world in fear. It shouldn’t be the case, but is so. Stearman makes the point that “Bible-believing Christians shouldn’t be surprised at the way world events point toward an extraordinary chain of catastrophes, it seems that many of us do. That is troublesome. Many of us are involved in building underground shelters, storing up food and supplies that will last – hopefully – for months, if not years. Do we find this in Acts? I don’t see it. Yes, I note that Christians shared what they had with other believers and it certainly may come to that, but I wonder if storing up things for future use is a good use of our time and resources? I’m not saying that we shouldn’t buy extra food at the grocery store. I’m not saying that we shouldn’t have a garden if we can. I’m not saying that making general preparations as if for a natural disaster is not a good idea. What I am saying is that to depend upon these things may remove our sense of dependence upon the Lord. I believe that it is responsible to do what we can to save for the future, but not so much so that are entire energies are involved in it. God expects us to be intelligent and to use common sense because He gave us both, but He also expects us more than anything to depend upon Him. The truth of the matter seems to be that – and Stearman alludes to this numerous times in his article – God will provide for His children! We do not need to fear what is coming! If you want a garden, go for it. If you want to stock up on food, do it. But don’t do these things out of fear! Do them because it seems like a good idea. In truth, people may wind up converting their basements into storm shelters, complete with food and drink that will last for years. However, those stores might be gone in an instant through theft or looting. What would you do if 50 people descended on your home at the same time? Do you have enough weapons to keep them at bay? Should you shoot to kill? Frankly, I don’t want to be in that position myself. I would do what I could to protect my family, but the idea of taking someone’s life is difficult to deal with emotionally. Stearman closes his article by quoting Psalm 112. I suggest reading it. He also quotes Proverbs 14:26 which tells us that the only fear we should have is fear of the Lord. We should fear not pleasing Him. We should fear not walking in His steps. We should fear bringing dishonor to His Name and we should fear not depending upon Him. “In the fear of the LORD is strong confidence: and His children shall have a place of refuge,” Proverbs 14:26. That sounds inexorable. It comes across as contradictory. How can fear produce confidence? It happens when we place our faith in God’s ability to save and keep us. As we fear not pleasing Him, we use our time on this earth wisely. That may include planting a garden or buying additional food. But ultimately, it means complete reliance on Him. What is the promise? His children shall have a place of refuge. What better promise is there? The word “refuge” implies troubled times. We may well as a nation and world be headed for trouble, but God is faithful and will provide for His children. Are you faithful? Are you fearing the Lord? Let’s do that so that He will be glorified in and through us. Entry filed under: 9/11, alienology, Atheism and religion, Barack Hussein Obama, Barry Sotero, Communism, Demonic, dispensationalism, Eastern Mysticism, emergent church, Gun Control, Islam, Islamofascism, israel, Judaism, Life in America, Maitreya, new age movement, Posttribulational Rapture, Pretribulational Rapture, Radical Islam, rapture, Religious - Christian - End Times, Religious - Christian - Prophecy, Religious - Christian - Theology, salvation, Satanism, second coming, Sharia Law, Socialism, temple mount, Transhumanism, ufology. Tags: gary stearman, mayan prophecies, prophecy in the news, the year of fear is here. I liked that you said someone could come along and take our stores. I’ve always feared that, lol! But, I do try to can up as much food as possible out of our garden just because I can. The older I get though, and after having had a minor stroke that greatly weakened me, I can’t do as much as I once did on the food prepping/storing. But, I can certainly trust God to provide. He has, after all, carried me thus far and I’ve had some really bad scares in my life. I agree. We do what we can always trusting in His ability to supply our needs. What bothers me is prophecy teachers that are pushing the same survival goods that the lost are selling and it seems that they are doing this to make money. They send a double message when they teach that Jesus is coming at any moment to take us home and then in the next breath tell us to stock up so that we can be ready for some major catastrophe. They seem to loose credibility when it comes to the teaching of the bible when they push survival mentality. I am going to trust that God provides what I need and maybe if something horrible happens before the Rapture, it may be his timing that I go home to see him. If you look at things biblically – at least what we know from the Bible and granted, God did not tell us everything – it seems like things really get BAD when the Tribulation STARTS. I don’t believe we will be here then and you’re right – to focus on that survival mentality is wrong, in my opinion. I used to think there was nothing wrong with it, but I agree with you. I don’t think my focus should be what I THINK I’ll need. My focus should be doing the will of Him who called me into His glorious light by His grace. Thanks for your comments, Nelson.